Pitsea is a small town in south Essex, England. It comprises five sub-districts: Eversley, Northlands Park Neighbourhood, Chalvedon, Pitsea Mount and Burnt Mills. It is part of the new town of Basildon. He enjoyed initial acting success with small parts in Casualty , Hale and Pace , The Bill and EastEnders . Scott also performed on stage in London's West End & the Edinburgh Festival with Ron Moody in Peter Pan and in the National Youth Music Theatre Production of Whistle Down the Wind before turning his attention to music with Five. Hale and Pace were an English comedy double-act that performed in clubs and on radio and television in the United Kingdom in the 1980s-1990s. The duo was made up of Gareth Hale and Norman Pace, with the Hale and Pace television show running for ten years and 66 episodes, between 1988 and 1998. Chris Brooks is a British radio presenter and DJ from Eastbourne, East Sussex, England, Currently presenting for Radio Essex as a presenter on their Hit Music Breakfast Show. Soccer AM is a British football-based comedy/talk show, produced by Sky Sports. On 17 September 2006, an announcement was made via Five's official Myspace page that a press conference was to be held at The Scala in central London on 27 September. After a venue change due to a shooting at The Scala, the conference was moved to the Bar Academy Islington. It was rumoured that four of the five members would be reuniting (Conlon now being committed to his Sony deal),  and this was confirmed at the press conference. Five recorded new material for what was to be their fourth studio album, working with Guy Chambers, Swedish producer/songwriter Anders Bagge, and French DJs Trak Invaders. They also planned to tour in 2007. By January 2007, Five had completed half of their album and were looking to be signed to a record label with new manager, Richard Beck. The album was expected to be released within the next few months. On 8 March 2007, at midnight, Five premiered one-minute clips of three brand new songs that were to have been on the new album. The songs, titled "70 Days", "Settle Down" and "It's All Good" can be heard on the band's official webpage and also on their Myspace page. Beck also secured an MTV documentary series titled Five - The Revive. 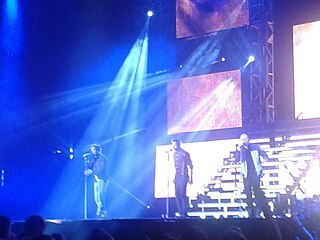 On 17 October 2012, Robinson revealed via Twitter that Five had would be taking part in an ITV2 series called The Big Reunion at some point in 2013. The show also features the reunion of Atomic Kitten, Liberty X, B*Witched, 911 and Honeyz. The show began airing on 31 January 2013. In January 2013, it was reported that Five were looking to find a new member to replace Brown,  and they were also having disagreement over the group's name. The band eventually decided to continue as a four-piece, and took part in a gig at the Hammersmith Apollo and later The Big Reunion arena tour. As of 26 October 2008, Robinson appeared in Celebrity Scissorhands which coincides with the BBC charity Children in Need . He got into the final on 9 November after the contestants made an anonymous vote. He also appeared on an episode of Test the Nation in the Robinsons group. Kerry Jayne Elizabeth Kay is an English singer and media personality. She was a member of girl group Atomic Kitten from 1998 until her first departure in 2001 and again from 2012 until her second departure in 2017. Her television work is predominantly in light entertainment and reality shows. The discography of English boy band Five consists of three studio albums, four compilation albums, thirteen singles, fourteen music videos and three video albums. Five's debut album, 5ive, was released by RCA Records in the United Kingdom in June 1998 and peaked at number one on the UK Albums Chart and has been certified double platinum by the British Phonographic Industry (BPI). The first single from the album, "Slam Dunk ", peaked at number ten on the UK Singles Chart and within the top thirty across most of Europe. Follow-up single, "When the Lights Go Out", was more successful, peaking at number four in the UK, number two in Australia and number ten on the Billboard Hot 100 in the United States. Other singles released from the album, "Got the Feelin'", "Everybody Get Up", and "Until the Time Is Through" all peaked within the top three in the UK and Ireland, and all three have been certified silver by the BPI. 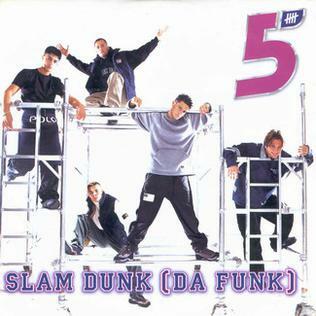 "Slam Dunk " is a song by British boy band Five, released as their first UK single in late 1997. It appeared on their first album, Five, in early 1998. The song reached number 10 on the UK charts and sold around 500,000 copies worldwide. Featuring a blend of pop and rap, the single was written and produced by Jake Schulze, Max Martin, and Denniz Pop. The track contains a sample of "Clap Your Hands" by Herbie Crichlow. ↑ "Official Myspace Page, September 2006". Major Announcement on 27/09/2006. Retrieved 17 September 2006. ↑ "The Sun.co.uk". Five are back... as Four. London. Archived from the original on 23 September 2006. Retrieved 23 September 2006. ↑ "MTV.co.uk". 5ive: "we're gay". Retrieved 29 September 2006. ↑ "Whatever Happened To... Five?". This Must Be Pop. 23 January 2011. Archived from the original on 15 March 2012. Retrieved 9 April 2012. ↑ "The Vg star Sean Conlon's comeback ends early on new show". Metro.co.uk. 24 March 2012. Retrieved 21 April 2012. ↑ "5ive Sean Conlon has another shot at fame after The Voice boot". London: The Sun. 30 March 2012. Retrieved 26 January 2013. ↑ "Warrington Warrior - News". Warringtonwarrior.com. Archived from the original on 15 September 2012. Retrieved 26 January 2013. ↑ Eleanor (30 March 2012). "Sean Conlon plans 5ive reunion after The Voice rejection". Uk.omg.yahoo.com. Archived from the original on 2 April 2012. Retrieved 26 February 2013. ↑ "Kerry Katona and Atomic Kitten pals reunite – The Sun –Showbiz–TV". The Sun. London. ↑ "Atomic Kitten get mew start". The Sun. 10 January 2013. Retrieved 26 January 2013. ↑ "Official Website, September 200". Birth of second son. Retrieved 17 September 2006. ↑ Rigler, Natasha (8 September 2013). "5ive's Scott Robinson and wife Kerry expecting twins!". Reveal magazine. Nat Mags . Retrieved 17 September 2013.